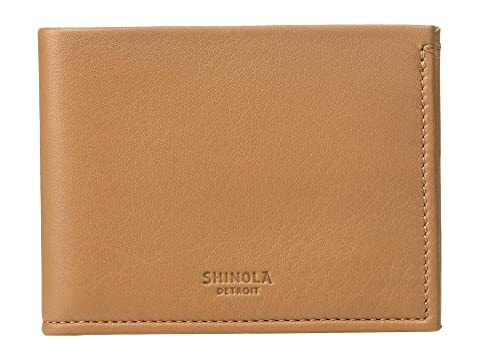 Tuck your cards and cash away into the incredibly handsome Shinola® Detroit Slim Bifold wallet. Made of Horween Essex leather. Currency pocket features leather lining. Six card slots feature faille lining. Built in U.S.A. with domestic and internationally sourced components. We can't currently find any similar items for the Slim Bifold by Shinola Detroit. Sorry! I bought this wallet for husband to replace the old one which was falling apart. I made a conscious effort find a quality leather wallet and hopefully one made in the USA. This one seems to be exactly what I was looking for, good looking, slim-line, and made in the USA (Detroit, MI) using American leather. It arrived and looks to be an excellent quality product. My husband was very happy with my purchase! Overall: Rated: 1 stars! Comfort: Rated:1 stars! Style: Rated:2 stars! I bought this wallet for my husband's birthday and just after the 1 year warranty ended, the lining had separated from the leather Shinola refused to replace or repair. I am amazed they claim to be a high quality, craft brand with this kind of attitude to their work.